Now onto the Radio them selves. As a person that is still kind of new to prepping (a little over a year now) This is something I keep putting aside. Why because the chances of needing it are slim in my part of the country. I prep for hyperinflation and or the grid going down. Now because of that grid going down thought I know that this is really something I should get but it is a higher priced prep so I do not want to get the wrong one! No matter what you are preppering for having minimal communication with the outside world is something to think about. Remember if power goes down on a larger scale you may not have cell phone use. But being on a budget I am looking to get a cheaper choice. ***First read this... GMRS vs CB......Click Here I found it helpful GMRS are the first two radios below..and the last on it a CB. I have been looking for that cheap option and found a few on Amazon. (I am not trying to sell these or make money on them because my state has ban credit for Amazon referrals). 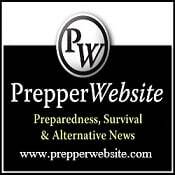 Talking to some preppers was very helpful and many suggest Midland products and grundig ones to. I came across a few and want to share them with you, but I am also looking for feed back on any better ideas (that are affordable). I always suggest shopping for better prices or waiting for a sale on a deal like this. 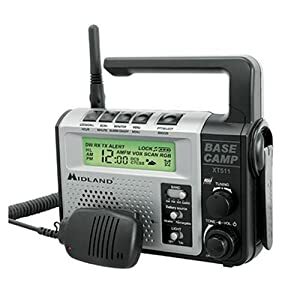 Midland XT511 GMRS Two-Way Emergency Crank Radio $62 they are out right now but should be in stock soon. Features VOX automatic voice-activated operation, and a USB port for charging cell phones, radios, etc. What I like is you can reach the outside world for help. 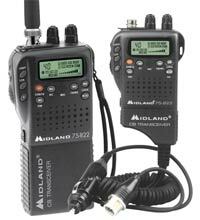 It can be used with Midland XT511 GMRS Two-Way Emergency Crank Radio so you can expand the set up over time. I was looking at solar ones, which I really wanted that option but when keeping cheap I could only find solar without the 2way. You can always get a solar battery charger for the AA batterys and BAM your solar! The 75-822 offers 40 separate communication channels, delivering the maximum CB communication range with 4 watts of output power.Channel scan can automatically check all channels for activity, stopping on any active channel for five seconds. You can also store and instantly access up to five of your favorite channels in memory. When you flip on the device, a last channel memory feature will turn on the last channel you selected before powering off.While communicating, a built in ANL (automatic noise limiter) improves reception for weak signals, and squelch control further eliminates background noise. 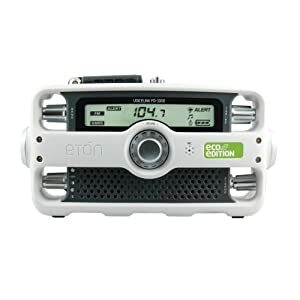 The 75-822 features instant access to NOAA Weather Radio, for weather/hazard information in your area 24/7. Immediate access to emergency channel 9 and informational channel 19 is also provided. The Dual Watch feature lets you monitor channel 9 and another channel of your choice simultaneously. Power With AA Batteries or Vehicle Power Port You can power this unit with six AA batteries, complete with a battery life extender feature. To get even more from your batteries, high/low transmit power settings are provided (4 watts and 1 watt, respectively).A mobile adapter is also included for powering directly from your vehicle's "cigarette lighter" power port. Now this does not have your regluar radio or phone charger on it like the other two but if you already have stuff that can cover this, I think this would be the way to go because it has mmajor distance! And here is a review on this one. Any thought PLEASE comment on this one. Cuz I will be getting mine in a few weeks and I really want to get the right ones. I am currently attending classes that are offered free by the Ham Radio club in our area. The beginning license called Technician will allow me to broadcas and receive on certain frequencies. The radio I got off Ebay which are available lots of places is the Baofeng model I got the first one I saw but a better model is the 5V -- only about 50.00 to 60.00 bucks and works good. Thanks Shamus, I was looking into the classes non close to me. But good point to make. 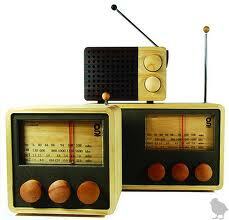 You do need a license for these radios to transmit. I got mine for emergency's. Will set up a private channel for the family. I choose the midland totally because it have a radio and handcrank and the 2 way. So I can set it up in my kitchen and always be alert. Trans Communications experience, technical skills, availability and reliability, price and interest in our project made them our first choice for this service and a pleasure to work with. They are a full service provider, with the ability to assist at all times. transcommunications provide services for 2-Way Radio System, online sales in AUS , wireless radio system, radio walkie talkie and more in your area. We offer a complete and comprehensive product line of high quality two way radio replacement batteries. Our two way radio batteries are designed to be fully compatible with the original equipment. Thanks for the following blog, I am aslo looking for a good charger and earpiece for my Two-Way Radios. Thanks for this useful post. I also like waterproof radio! Thanks for showing good videos.